The people who will truly understand us are on "the journey" themselves. What journey? It is different things for different people, but we may think of career fulfilment as an element of success. As the call for professional specialization in the 21st Century rages on, all those steering the ship of their career face diverse navigational challenges that vary according to individual circumstance. In the Nigerian context of law practice, specializing hasn't always been emphasized; if there is legal work to be done for mouth-watering fees, hell, let's have that Brief. This can appeal to one's sense of variety as decent law practice exposes a lawyer to multifarious fields of knowledge; the thrill can go on and on. Besides, you don't want to unduly limit your income stream as a sole practitioner, for instance. But with trends in globalization and more complex transactions, there's now the growing emphasis on specializing and carving a niche for oneself as a lawyer. Some upsides of specialization include excellence due to reduced risk of error, and speed as one gets used to doing the same things over and over again. But some downsides include monotony, and limited skills set. In my view, monotony can be circumvented by selecting a combination of practice areas which blend perfectly, and by getting involved in research. We shouldn't take away the fun by being overly rigid; every human has capacity for diverse interests. But we can be known more for certain things. That's specialty. Regardless of specialty, we still need to be voracious readers of anything related to law and to clients' needs. That way, we would know the direction to point a client for help on an area of law in which we don't take Briefs; don't leave a client or sincere inquirer in the lurch. There are diverse opinions on the subject of when to choose a practice area in which to develop specialist expertise. Some lawyers feel you should choose early (as a law student if possible) and commit. For some others, new wigs should not bother with specializing at such tender age at the Bar. This is because in figuring out what they should specialize in, most lawyers are guided by the nature of practice they get exposed to over time. So young lawyers need only explore; their niche will find them on their voyage of self-discovery. That line of reasoning may have some merit, but one must also realize the danger of becoming a perpetual voyager in the sea of self-discovery, or just hanging like a piñata at the mercy of whatever hits you in law practice employment. If one can get down to it earlier, wouldn't that be better? Completely leaving things to chance isn't the best way to go. True, it may work for some persons but that should not be our blueprint. So I'd say don't take either extreme view. It is fine to attempt planning out details for your career, but bear in mind that regardless of plans, life happens and change is constant. Don't float helplessly either. While keeping an open mind and gladly doing work which we're exposed to as young lawyers, we should have a vision that potentially hinges on the intersection between our individual talents and passion(s). A sketchy framework is important; as we go on our journey we will make periodic assessments and see ways to flexibly flesh up that skeletal structure. So let's make a note of our long-term goals and steps we could take to achieve them (short-term goals). The importance of a note is that whenever we seem to be losing focus, because life's everyday challenges can sometimes make us forget where we are going, what we're supposed to be doing and why, a review of our written or electronically noted goals helps us remember, and do whatever it takes to recharge ourselves and get back on track. Yes, thinking about career path and career plan early in one's career is important, rather than just going with the oceanic flow and ripples, because such advance thought influences the opportunities available to a person in future and which that person will be equipped to take. Some of us are naturally eclectic and cannot be boxed into a pigeonhole. But the idea is, whatever you do, be extraordinary at something by playing to your strengths and interests. Young lawyers have varying circumstances - Some have always known what they wanted to do, and will not change their mind about it; the only question is how to get there. For others, in trying to begin with the end in mind, visualizing that end or big picture can be a very hazy endeavour. A lot of motivational videos and texts talk about pursuing your dream and never giving up on that dream. Yes, that's good. But what becomes the fate of a young lawyer who tries hard to see a dream, but just can't. What happens where one feels frustrated, lacking in direction or passion for anything, even in one's chosen profession? People can begin to set meaningful goals and gladly pursue them no matter the setbacks, when they have a dream that gets them excited and a reason for that dream. We may prettify the situation, but the truth remains that many young lawyers have fallen into this ditch at one point or the other. What if you are good at what you do but you just don't enjoy what you do? This is possible. Are these lawyers doomed to settle for a life devoid of primal joy that should flow from one's work? I sincerely hope not. Figuring out one's potential practice focus is no easy task. Some young lawyers may feel like they have an affinity for certain areas of law and then a month later they don't quite feel the same way. According to Senator Ihenyen, not being able to decide is not a problem; it is a process. Such state of flux occurs because one's brain is still processing data already taken in on the relevant subject. It may also be a result of negative thoughts. But the brain can be reprogrammed. A young lawyer in this sort of flux need not have the mind-set of "looking for something to fill a career vacuum" or focusing on what is presently lacking. Rather, we should program our mind to "understand that we are on an exciting journey to self - rediscovery". Do not dilute the future with a "negative" past or present. 1. Read various texts, whether law-related or not. I had an unexpected insight one evening when I was reading a business-related book by Brian Sher. He mentioned one rule of successful marketing in business: focus on your clients'/customers' needs rather than your service or product. This principle seemed like something that could assist me with my difficulty choosing a field of law practice within which to carve my niche as I started trying to identify problems most businesses in Nigeria face and how lawyers may assist. Also read everything you can about various practice areas. 2. Attend events, especially law-related events like law week technical sessions, CLE Conferences, virtual mentorship sessions. These events provide data with which to feed one's imagination. 3. Talk to practicing lawyers including mentors, and former or present professors. Talking to other lawyers helps us know the kind of clients or issues that lawyers in a specialty work on, daily activities in that practice, what's most rewarding and what skills are important for that practice area. Even if we can't get a sit-down with them we can leverage on communication technology to reach out to them. 4. Beyond what others tell us, we should learn from our own experiences. Even dead-end jobs are not a waste; each one is an indicator of what you don't want to do and could help you realize that you don't possess a disposition for that field. Identify the good parts that you enjoy and the bad parts that are so bad for you that you can't imagine doing them for the next 30 years of your life. 5. Know yourself – your disposition or temperament, your talents, and what motivates you. This is important because 3 keys to lawyer satisfaction are sincere interest in the subject matter, enjoying the daily rhythms of the job, and work appealing to the core of one's personality. Different practice areas may suit different personalities. It is generally suggested that litigators who enjoy their work truly enjoy research, writing, analytical thinking, developing strategies, and advocacy. One who loathes these things or is really uncomfortable with confrontation should think twice before committing to litigation as a practice area. I am of the view that you must also consider what drives you and gives you a sense of fulfilment. It's different strokes for different folks and we shouldn't always be quick to judge one as more wholesome or unwholesome than the other. Sometimes, it's neither here nor there. 6. Reconnect with your natural inclinations and curiosities. Those things that made you weird as a kid could make you great today. It's crucial to consider income earning potential, but focusing on external validation and prestige could make us work not on what we like, but on what we would like to like. Also, what we're doing when we're not working can provide us with insight into what work best suits us ; just link it to law. 7. Consider your academic background. Finance or accounting background or aptitude will be useful for work on tax and capital markets, for example. A general litigator with a background in the sciences will likely excel at litigating patent claims. It also helps to look back at some classes you took as an undergraduate or in law school. What courses did you enjoy and what courses would you be happy never to take again. However, in doing this assessment I recommend differentiating between enjoying a course because you liked the teacher/lecturer and enjoying your personal study of that course. 8. Observe market considerations in relation to where you see the economy heading. It should help if we take time to research the legal market and understand what industries are driving business and what type of legal services they will need. Being aware of market trends and disruptors also provide exciting opportunities. In Nigeria, some fastest growing industries include IT, Agricultural, Oil and Gas, Entertainment, Pharmaceuticals, and Education Industries. 9. Having a role model can help. When you have a career direction and zero in on a particular area to specialize in, role models help you guide your path. The danger I see in this, though, is a tendency to become overly influenced by that role model and end up living someone else's life. So please be self-aware and strike a balance. 10. Consider your eventual destination. Think 30 years from now, where do I want to be? This can be challenging since goals may change over time and there are no guarantees. 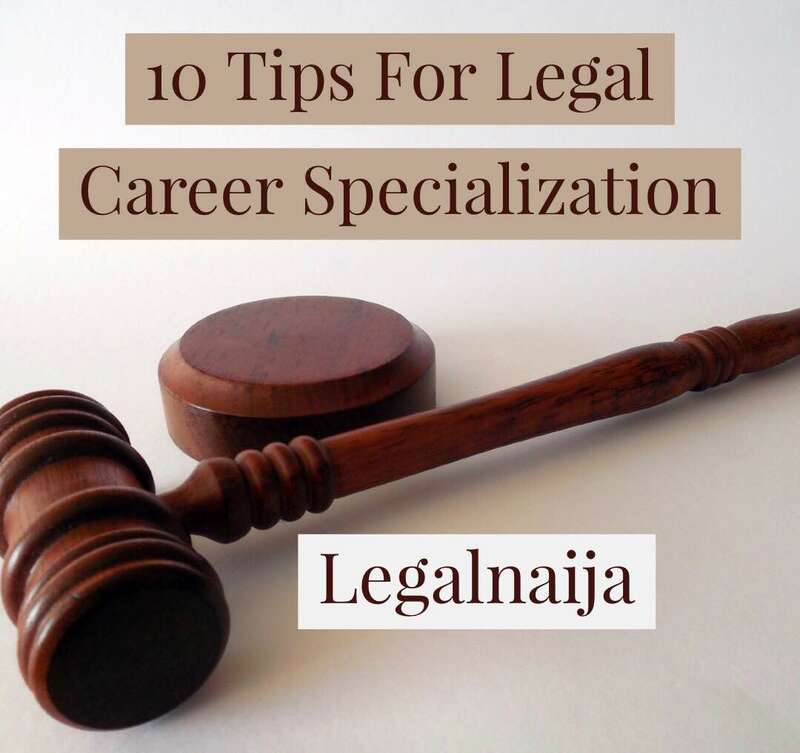 But if you intend to eventually transition in-house, for instance, you may have more options as a general corporate lawyer. There is no static formula for choosing a law practice specialty since we are unique individuals with diverse circumstances and motivations. Every lawyer's path and progression cannot have the same trajectory. But through thoughtful research and conversation we can gather as much data as possible to make this crucial decision. Take your time; you and only you will make this decision for yourself. You've got this. 8. Lisa Abrams and Lois Casaleggi, ‘Finding a Legal Specialty, Appealing to the core of Your Personality’ (March 2010) Yale Law School < https://law.yale.edu/system/files/documents/pdf/CDO Students/YLS Handout Packet.pdf > accessed 31 May 2018. Uchechi Anyanele practices law in Lagos, Nigeria. Outside her legal work, she enjoys reading books on self-improvement, proofreading written text, and absorbing musical lyrics. She is passionate about continuous improvement for lawyers.